Welcome to the first in a series of tips on using the University Collaboration Suite (UCS). This initial entry focuses on setting up an automated email response. This feature is essential for easily notifying others when you will not be available, from a long-term vacation to an afternoon off. In UCS, click on the Preferences tab in the top menu bar. 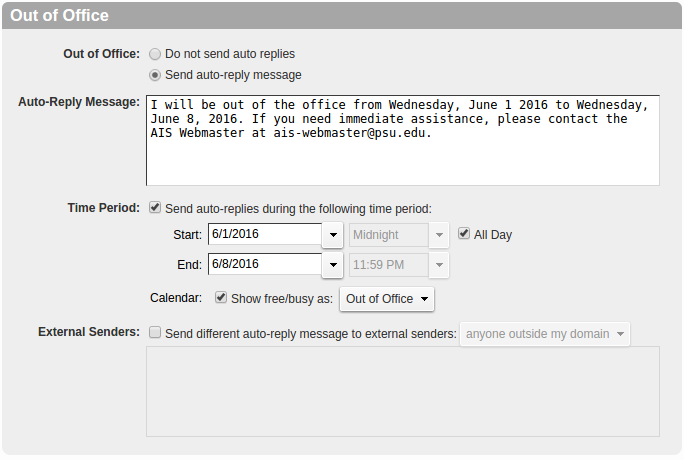 In the Auto-Reply Message field, type in your detailed message (think about what would be most helpful to those receiving your auto-reply; perhaps include contact information for another staff member or group who might be able to help in an urgent situation). Next, select the Time Period for which you would like the automated email response to begin and end. You can also control how your time away shows on your Calendar, choosing options in the dropdown menu. When you are away you can still access your emails and UCS will give you the option of cancelling the automated response or allow you to keep it in place. This feature is a courteous way to inform people that you are unavailable, and that you will get back to them.